Theater or Netflix? How the two experiences stack up for the acclaimed film. Roma is captivating audiences both at the theater and on the television screen. It's a common dilemma for moviegoers these days: Should I go out to the theater tonight, or should I stay in and watch Netflix? This holiday season, movie fans will get to do something rarer: Make the theater-or-Netflix choice, only about the same movie. 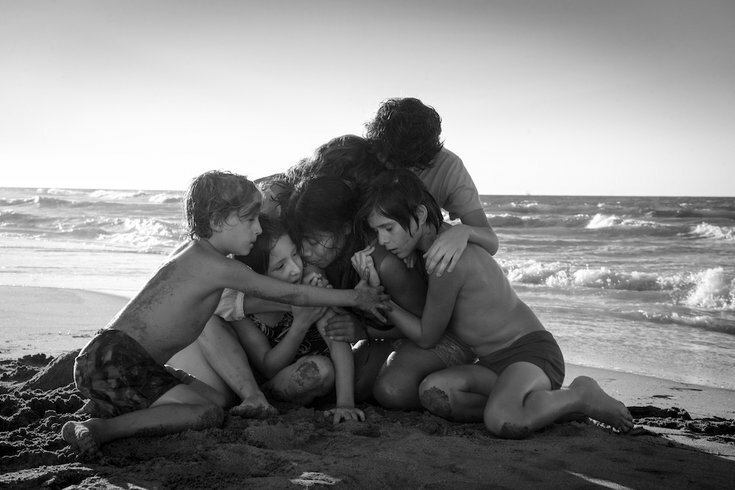 Roma, the latest film from director Alfonso Cuaron and one of the best movies of 2018, is now playing on local screens. The film, based on Cuaron's childhood in the Roma area of Mexico City and his family's relationship with their indigenous housekeeper, is now playing at the Ritz at the Bourse in Old City. It's also playing at suburban theaters such as the Bryn Mawr Film Institute, The Colonial Theatre in Phoenixville, and the Ambler Theater. But as of last Friday, there's another way to see Roma: It's streaming on Netflix. It was a win-win for both sides: Cuaron received distribution for his extremely personal two-and-a-half-hour film that's in black-and-white, not in English, and includes no movie stars, with Cuaron himself serving as the director, writer, editor, and cinematographer. It's a deal he might not have gotten from a traditional studio. Netflix gets a good shot at its first-ever Best Picture Oscar, with Cuaron getting multiple bites at the Oscar apple (directing, writing, cinematography, foreign film) himself. But for a movie to be eligible for Oscars, a theatrical release is required. And for Roma and another Netflix film this fall, The Ballad of Buster Scruggs, Netflix has carried out a larger release, around the country, rather than merely sneak them in New York and LA. Roma has been rapturously received at film festivals, including Philadelphia's back in October. The Philadelphia Film Critics Circle, of which I am a member, voted it the best film of 2018 earlier this month, while also giving it awards for Best Foreign Film and Best Cinematography. Other critics groups have also honored the movie, more than any other this season. The dual release, though, has led to lots of arguments among movie types on social media, with one faction arguing that the film must be seen on the big screen, with others arguing that such attitudes are "elitist," because after all, not everyone lives near a city where the film is playing. If I had to recommend one or the other, I'd opt for the theater. I tend to think watching the film either way is defensible, but allow me to lay out the arguments for both. Roma stands as one of the most personal films any director has made. I first saw Roma at the Philadelphia Film Festival screening on October 21, at the Philadelphia Film Center, the Center City venue formerly known as the Prince Theater. The screening, which was sold out and totally full, started minutes after the Eagles blew that 17-0 lead against the Carolina Panthers. But the film's artistry, beauty and poignancy, especially on the Film Center's huge screen, improved everybody's mood considerably. Also, when I saw the film, M. Night Shyamalan happened to be seated a few rows behind us. If you go and see Roma at the theater, I can't promise you'll get an M. Night sighting. But what you will enjoy, in addition to the big screen presentation, is all of the trappings that can only come with a cinematic experience. The popcorn. The previews. And the communal experience of seeing a big, exciting movie with a crowd, complete with discussion afterward. With Roma only playing on one screen in the city, and likely for a limited time, the theater may very well be crowded for most evening showings. There's something to be said for one of those rare movies that has the feel of an exclusive event. Several friends of mine, a few weeks ago, caught the one-night-only local showing of the unrated cut of Lars von Trier's new movie, The House That Jack Built, at the PFS Roxy. I've been told by just about everyone who went that the evening had a special energy to it, with a future cult film enjoyed by a sold-out crowd in a tiny theater. I sadly missed it, however, and didn't get nearly the same experience when I saw the same movie at an 11 a.m. press screening on a weekday, in which I was the only person in the theater. Another good reason to see Roma in the theater? You'll pay much better attention if you don't have the distractions of home, which is especially the case for movies, like Roma, that have subtitles. Watching Roma at home is a completely defensible choice, and I'm not going to look down on anyone who does so. And that's because "watching a movie at home" doesn't mean what it used to mean. TVs have gradually added quality and screen size even as the prices have dropped, and as many holiday shoppers likely realize this year, it's now extremely possible to buy a decent-sized flat-screen TV for only a couple hundred bucks. We're far removed from the days of Blockbuster VHS tapes and CRT TVs. Other than, you know, not having to buy a ticket, there's one other big reason to stay home for Roma: It's only playing on one screen in the city, and that screen is the Ritz at the Bourse. Now, I rather like the Bourse- with that long escalator down from ground level, it has a subterranean vibe to it that makes me feel like I'm watching a movie in a speakeasy, and its staff is friendly and knowledgable. But its screens are far from the largest in the city. There's a reason for the Bourse exclusive: The nation's largest movie theater chains, including AMC and Regal, are not on board with Netflix's theater-and-stream-at-the-same-time gambit, so none of their theaters will show Roma. And while Film Society executive director Andrew Greenblatt told me in an interview in October that he has no qualms about showing Netflix fare either at the Film Festival or at the Society's own venues, Roma is not currently scheduled to open at the Philadelphia Film Center, keeping it off Center City's largest screen. The other advantages of Roma at home? You can pause it, rewind it, watch it all multiple times, and everything else Netflix allows. But I do request this: Please watch Roma on a Netflix-equipped TV, and not on your phone, tablet, or computer. Just about any TV purchased in the last five years has Netflix built in, so if you've been meaning to configure that on your set, now's a great time. I'm not going to say that people watching on their 50-inch TV aren't getting the full Roma experience, but those watching on their 9-inch iPhone screen certainly aren't. Watch Roma however you wish, either in a packed house at the Bourse, or in taking the opportunity to check out one of the independent suburban venues, all of which are excellent. But when it comes to Roma, whether you see it is much more important than how you see it. And when you're done, get to have this same argument again next year, when Martin Scorsese's gangster movie The Irishman arrives as a Netflix release.